VOLSEN is a leading manufacturer of CAS 132210-24-3, 2-Amino-3-(1,2-dihydro-2-oxoquinoline-4-yl)propanoic acid hydrochloride. Welcome to make an enquiry about CAS 132210-24-3, 2-Amino-3-(1,2-dihydro-2-oxoquinoline-4-yl)propanoic acid hydrochloride. remembering to include the information regarding purity and the quantity you require. These two factors may affect the price. 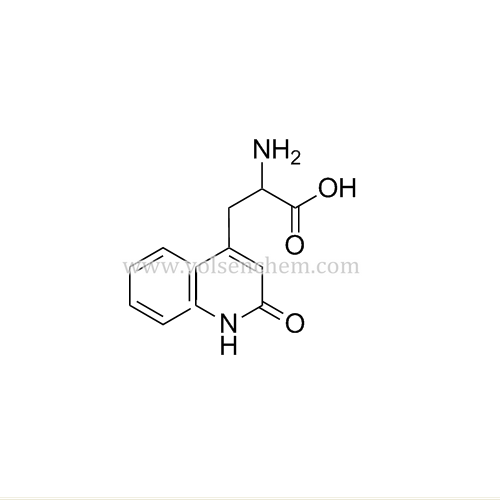 If you require any further information about CAS 132210-24-3, 2-Amino-3-(1,2-dihydro-2-oxoquinoline-4-yl)propanoic acid hydrochloride please do not hesitate to contact our experienced staff. Looking for ideal Pharmaceutical Intermediates of Rebamipide Manufacturer & supplier ? We have a wide selection at great prices to help you get creative. All the CAS 132210-24-3 are quality guaranteed. We are China Origin Factory of 132210-24-3. If you have any question, please feel free to contact us.